Binturan Range, Brunei Darussalam (June 28, 2003) -- A U.S. Marine gunner from the Cooperation Afloat Readiness and Training landing force fires on an objective from his Light Armored Vehicle (LAV) as a Royal Brunei Land Forces (RBLF) safety observer looks on. 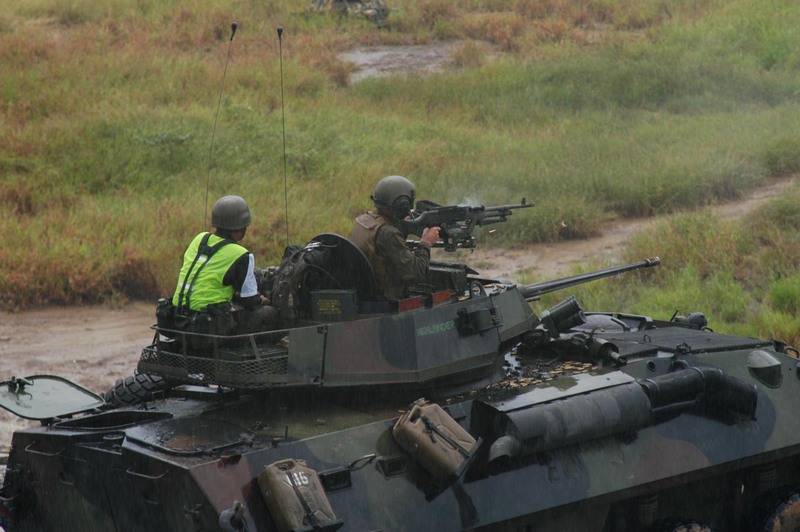 The training was part of a final live fire and amphibious event that included platoon-swapping, with LF CARAT Marines and Sailors, and RBLF soldiers working side-by-side to close out the Brunei phase of CARAT, which began June 23. CARAT is a regularly scheduled series of bilateral military training exercises between the U.S. and several Association of Southeast Asian Nations (ASEAN) countries. U.S. Navy photo by Lt. Chuck Bell (Released).